"The first step in designing a new Torment story is to ask the primary question," (Colin McComb, Torment designer,) wrote. "I’m older than I was when I worked on Torment, and my questions now are different than they were. I have children now, and I look at the world through their eyes and through mine, and that’s changed me—in fact, the intervening years have changed me so much that I have new answers for the central story in the original Torment. So now that I know what can change the nature of a man, I ask: What does one life matter?... and does it matter at all?" They've announced the new name, Torment: Tides of Numenera, and put up a website. You can create an account and get notified when they start their crowdfunding drive, as well as submit & vote on ideas. Right now the ideas are mostly for the upcoming kickstarter (tier levels and potential rewards). Edit - The Kickstarter is live! It's set to end at Friday Apr 5, 8:00pm EDT. You are the Last Castoff, the final link in the chain of the lives of the being they call the Changing God. He once was a man who discovered a way to use the relics of the ancients to cheat death and skip across the face of centuries in a succession of bodies. But he never knew that his bodies lived on as his consciousness fled, a new consciousness arising in each. Now he has awakened an age-old enemy, the Angel of Entropy, and his days of change are gone as the Angel hunts him and all his works. That includes... you. What does one life matter? How Is Torment: Tides of Numenera Similar to Planescape: Torment? A Deep, Thematically Satisfying Story. The philosophical underpinnings of Torment drive the game, both mechanically and narratively. Your words, choices, and actions will be your primary weapons. A World Unlike Any Other. The game has a fantastic, original setting, with awe-inspiring painterly visuals, imaginative locations, truly offbeat items, and massive feats of magic. In Numenera, however, "magic" is actually something surprisingly different. A Rich, Personal Narrative. The story is thoughtful and character-driven—epic in feel but a deeply personal narrative, with nontraditional characters and companions who have their own motivations and desires that drive them throughout the game. Reactivity, Choice, and Real Consequences. The game emphasizes replayability and reactivity, and your choices will make a real difference. You can play the game with a different approach and discover entirely new pathways. Most important, we won't tell you how to play. The best ending is the one you choose, flowing naturally from your actions throughout the game. How Is Torment Different From Planescape: Torment? Torment is not a sequel to PS:T. It does not continue the stories of PS:T or its characters. Torment is set in Numenera’s Ninth World, a new tabletop RPG setting created by renowned designer Monte Cook (he and Colin wrote much of the material for the Planescape tabletop setting). Torment will use a new rules system that's based on the Numenera system but adapted specifically for a computer RPG. We'll strive to make Torment's combat system and encounters an engaging and entertaining part of the gameplay. We'll connect them narratively to the overall story. And, continuing the Torment tradition, we'll make most if not all combat avoidable. edit: ehhh. Tannhausered, just a bit. In the digital add-ons section it says you can add another digital copy for $20. I'll check that out, good catch Renji! Currently Playin: Trails of Cold Steel 2 (vita), Sekiro (Steam) and Mutant: Year Zero (Steam). If you didn't back the Wasteland 2 Kickstarter, the $45 tier gives you both games. Wow, they're on track to hit 200% funding in the first 24 hours... Hope they have some amazing stretch goals! According to Kicktraq (which I know is rarely accurate), they're trending towards $44.8M or 4,980% of their goal. Man, can you imagine a $45M Torment game?! Yeah, too early for that to be a valid estimate (which it isn't really intended to be anyway). Kicktraq does it's estimates by day, which throws things off even more near the start. $45M would put it in the blockbuster AAA space, double the average development budget. Torment has ludicrous momentum, but I don't think it's quite that much. Wasteland 2 asked for 900K and got 2.9M, but Torment has a bit more name recognition, and a slightly more recent cult following. I'd guess it'll end up around the 4-5M mark, but I'm prepared to be wrong. Im a late comer to the whole RPG field. I grew up with civ,total war and starcraft and missed all these kind of games. I didnt know I liked rpgs until dragon age origins. My question is Do you think this game- its character models mainly - will look at least as good as DAO ? I know they will be vastly different games BUT my problem is I find it hard to play with dated graphics (by dated i mean pre when i entered the field) after loving DAO, NEW Vegas, witcher , Skyrim etc I tried to go back and get into some of these glory day RPGs (balders gate etc) and failed. The new Torment will undoubtedly go for style over polygon count, but it will look better than the original Baldur's Gate. I would guess it will be at the technical level of Dragon Age: Origins, but much more stylized (atmospheric). tldr; Buy the game already! Just to cheer you up if any of the above made you sad: Boobies. • We do want to be abundantly clear that no Wasteland money is to be spent developing Torment. No Torment money is being spent on Wasteland 2. That said, lots of tools, plug-ins and pipeline processes that have taken man months to create will be shared between the projects if we can keep team continuity. • The pre-production of Torment is not going to hinder the development of Wasteland in any way. As explained above, they are different teams during the pre-production. They're at $1.6 and climbing..... Wasteland was 2.9, so it'll be interesting to see where this comes out. What I actually found more interesting to think about is the way they're trying to keep their pipeline full.... his talk, in the Wasteland update, about the 'team and a half' approach they're using is really interesting. This also means that, around the time that Wasteland ships, they'll need to come back with a new idea, to keep feeding the monster. Wonder what it'll be? Boy, being on the half team would definitely be the fun part of the job! Same engine as Wasteland 2 and other recent games, like Path of Exile, so just check those out for an idea of what can be done. Steampunk. Mark my words. Lovely, lovely Steampunk RPG. What did you think of Arcanum? Final Warrior Quest - Play it for free! Agent of Fate - Play it for free! So I can make myself at least a bit useful, here's Wasteland 2 gameplay footage. Arcanum is #1 on my list of flawed masterpieces. I absolutely loved that game and wouldn't think twice about backing development of a sequel in that style. In at $75, but I really wish there was a way to get the $35 tier and just add on digital copies of the Numenera RPG player guide and core book for, say, $20 each? and make it $75 without the extras. I'll be willing to give up the alpha/beta test slot so that I can come in to the game and story fresh. Kicking myself for missing out on the Numenera Kickstarter now. YES PLEASE. And good gobb someone get it right this time. Dialing it back abit: since Wasteland was tile-based and P:T was isometric, someone hire inExile to redo old classic tile-based and isometric games as long as people are willing to give them money to do so. "When you can, you hit that like the fist of an angry god. It's not even for you anymore; you do it for us." "I'm everybody's hero, I'm Batman's Batman"
And perfect for the Unity engine that both Wasteland2 and Torment are made on. Is that the commercial Unity engine, or something internal they're calling Unity? The commercial Unity engine: here's the announcement, from last May. Yay! My Sony bone is getting tangled! Tanglebones is a better man than I, in tears at my desk. Man I would back the hell out of a Darklands kickstarter. I'm in on Torment. I can only assume that when the antichrist arrives he will be left handed, Australian, and attempting to steal our womenfolk. Prozac is a man's man. Or clinically insane. It's hard to tell. This pushed me over. I missed Wasteland the first time around and getting both while also supporting Torment? Don't mind if I do. I would have backed Torment regardless of how Wasteland 2 was coming along, but that Wasteland 2 is looking really good makes this a no brainer! Standing over a stained copy of an old Ronald McDonald ad, masturbating furiously screaming MY WAY! Why is Monte Cook writing for Torment 2 such a big deal? Anyway, less than 100k to achieve all stretch goals, and plenty of days to cover it. I wonder what's going to be the final number. Probably 3 million? 4? 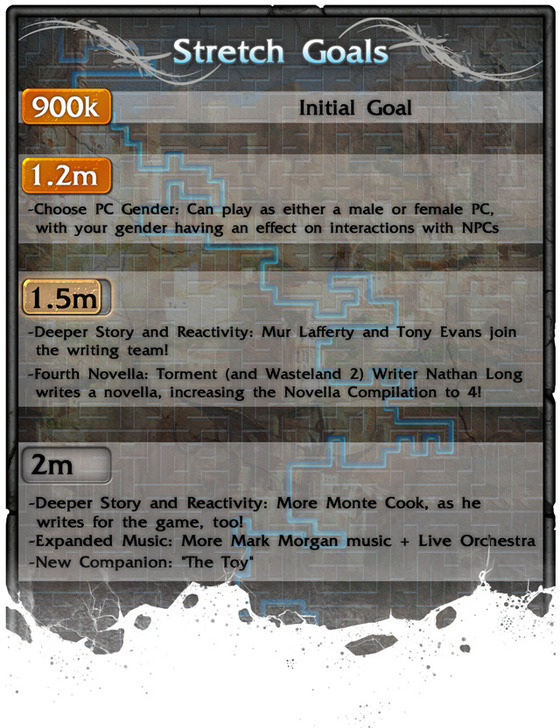 Monte Cook is a huge name in the realm of Dungeons and Dragons writing, especially Planescape stuff.